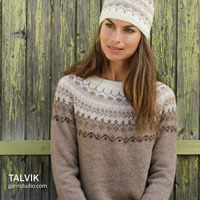 Go to original pattern for design DROPS Extra 0-823. DROPS STRAIGHT NEEDLES size 5 mm / US 8 - or size needed to get 17 sts x 22 rows in stockinette st in Alpaca Bouclé = 10 x 10 cm / 4'' x 4''. 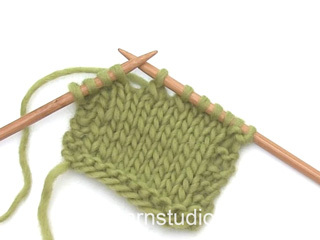 DROPS STRAIGHT NEEDLES size 7 mm / US 10½ - or size needed to get 10 sts x 14 rows in stockinette st in Puddel = 10 x 10 cm / 4'' x 4''. Bind off for button holes on right band. 1 button hole = bind off the 3rd band st, on next row cast on 1 new st over the bind off st.
ALL SIZES: 19, 27 and 35 cm / 7½"-10 5/8"-13 3/4"
Dec by K 2 sts tog inside 2 sts in garter st. 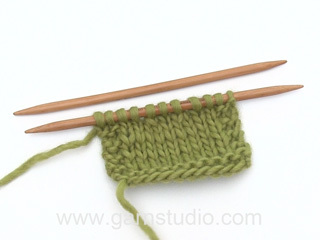 Cast on 76-86-92-102-112-126 sts (includes 1 edge st in each side) on needle size 5 mm / US 8 with Alpaca Bouclé. K 4 rows, continue in stockinette with 1 edge st in garter st in each side - see explanation above. When piece measures 10 cm / 4'', dec 1 st in each side, repeat dec every 11-5-5-5-5-3 cm / 4 3/8"-2"-2"-2"-2"-1 1/8" a total of 3-5-5-5-5-7 times = 70-76-82-92-102-112 sts. When piece measures 36 cm / 14 1/4" (adjust so that next row is from RS), switch to needle size 7 mm / US 10½ and Puddel, K 1 row from RS while AT THE SAME TIME dec 28-30-33-37-41-45 sts evenly = 42-46-49-55-61-67 sts. K next row (= WS). When piece measures 41-42-43-44-45-46 cm / 16 1/8''-16½''-17''-17¼''-17¾''-18'', beg to bind off for armholes. Bind off at beg of every row in each side as follows: 3 sts 1-1-1-1-1-1 time, 2 sts 0-0-0-1-2-3 times, 1 st 0-2-2-3-3-4 times = 36-36-39-39-41-41 sts. When piece measures 57-59-61-63-65-67 cm / 22½''-23¼''-24''-24¾''-25½''-26 3/8'', bind off the middle 8-8-9-9-11-11 sts for neck and finish each shoulder separately. Then bind off 1 st on next row towards the neck = 13-13-14-14-14-14 sts remain for shoulder. Bind off when piece measures 59-61-63-65-67-69 cm / 23¼''-24''-24¾''-25½''-26 3/8''-27 1/8''. Cast on 42-47-50-55-60-67 sts (includes 1 edge st in the side and 4 band sts) on needle size 5 mm / US 8 with Alpaca Bouclé. K 4 rows, continue in stockinette st with 4 sts in GARTER ST towards the middle (= band) and 1 edge st in garter st in the side. 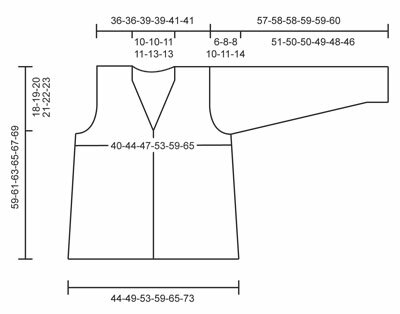 When piece measures 10 cm / 4'', beg to dec in the side as on back piece = 39-42-45-50-55-60 sts. 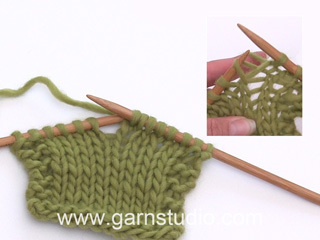 When piece measures 19 cm / 7½'', beg to bind off for BUTTON HOLES – see explanation above. When piece measures 36 cm / 14 1/4'' (adjust so that next row is from RS), switch to needle size 7 mm / US 10½ and Puddel, K 1 row from RS while AT THE SAME TIME dec 16-17-18-20-22-24 sts evenly = 23-25-27-30-33-36 sts. K next row (= WS). Continue in stockinette st and 2 band sts in garter st towards the middle. When piece measures 41-42-43-44-45-46 cm / 16 1/8''-16½''-17''-17¼''-17¾''-18'', bind off for armhole in the side as on back piece. AT THE SAME TIME when piece measures 42-43-44-45-46-47 cm / 16½''-17''-17¼''-17¾''-18''-18½'', beg dec for neck – Read DECREASE TIP. Then dec 1 st on every row from RS: 5 times, then on every other row from RS: 2-2-3-3-4-4 times. After all dec are done 13-13-14-14-14-14 sts remain for shoulder. Work as right front piece but reversed and without button holes. 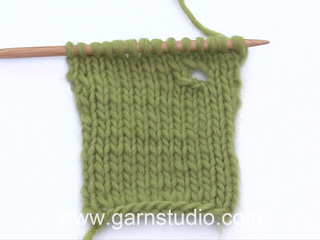 Cast on 40-42-45-46-48-49 sts (includes 1 edge st in each side) on needle size 5 mm / US 8 with Alpaca Bouclé. K 4 rows, then work in stockinette st until finished measurements. When piece measures 9 cm / 3½'', inc 1 st in each side, repeat inc every 5-4½-4-3½-3-2½ cm / 2"-1 3/4"-1½"-1 1/4"-1 1/8"-7/8" a total of 8-9-10-11-13-14 times = 56-60-65-68-74-77 sts. When piece measures 51-50-50-49-48-46 cm / 20"-19 3/4"-19 3/4"-19 1/4"-19"-18" - NOTE! Shorter measurements in the larger sizes because of longer sleeve cap and wider shoulders - bind off for sleeve cap at beg of every row in each side as follows: 3 sts 1 time, 2 sts 3-3-3-4-4-4 times, 1 st 0-2-2-2-3-5 times, then bind off 2 sts in each side until piece measures 56-57-57-58-58-59 cm / 22''-22½''-22½''-22¾''-22¾''-23¼'', then bind off 3 sts 1 time in each side. Bind off the remaining sts, sleeve measures approx. 57-58-58-59-59-60 cm / 22½''-22¾''-22¾''-23¼''-23¼''-23 5/8''. Sew in sleeves. Sew the sleeve and side seams inside 1 edge st.